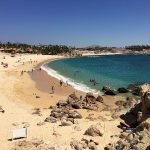 Chileno Beach is a swimming and snorkeling beach which is located along the tourist corridor of Cabo San Lucas, Los Cabos, Baja California Sur. These new photos were taken by Joseph A. Tyson March, 2016 with an iPhone 6s. 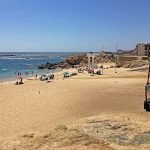 My recent trip to Chileno Beach (March 2016) was to see what changes have been made with all the construction in the nearby area. Access to the beach is well marked from the main highway. The parking area is not paved, but is graded and marked off for easy parking. Access to the beach is a short walk from the parking lot. 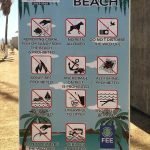 There is a lifeguard stand on the beach, trash disposal stations, and portable toilets, often referred to as a porta-potty, between the parking area and beach. 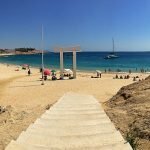 I went on Wednesday during Easter break and did not find the beach very crowded. 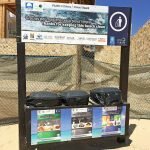 Playa Chileno has been named a Blue Flag beach by the Blue Flag programme that is operated under the auspices of the Foundation for Environmental Education and is headquartered in Copenhagen, Denmark. 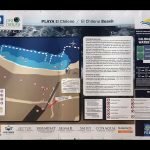 http://www.blueflag.global/. 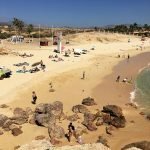 Playa Chileno is a must go to beach during your Cabo San Lucas, Los Cabos visit or vacation. 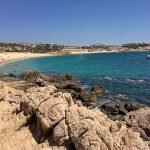 Why: Chileno is the most popular beach along the coastal corridor that connects cape cities Cabo San Lucas and San José del Cabo. 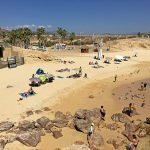 It’s not surprising since the beach is a beautiful place to spend a summer day. 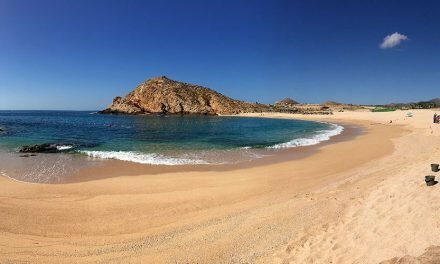 It’s Blue Flag–certified for cleanliness, safety, and water quality by the IMNC (a Mexican regulatory agency) and also offers superb swimming and snorkeling. 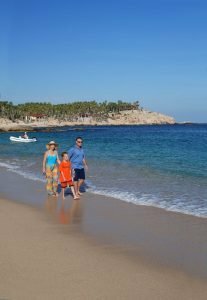 When: For the full Chileno experience, visit on weekend afternoons, when local and visiting families blanket the beautiful beach, clustering under shade-giving palapas and wading into the warm blue water. 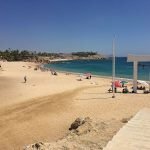 Where: Chileno Beach is located just off the highway, at about km 14, along the Tourist Corridor. 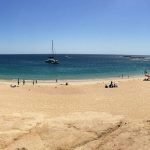 Already a popular destination for locals and tourists alike, Chileno Beach (Playa Chileno) has been made all the better by recent improvements: new signs, new palapas providing much-needed reprieve from the sun, even a wooden walkway. Come during the week to avoid the larger crowds that pack in come Saturday and Sunday. Vendors hawk tacos and buttered corn, children run in and out of the water, and parents relax under the palapas or private umbrellas. 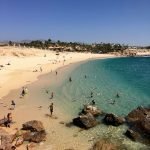 There’s also a reef that’s great for snorkeling and spearfishing. Chileno does have nice, clean restrooms, but you’ll want to bring your own toilet paper. 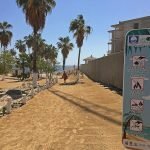 Follow the signs near the Chileno Bay Club for Chileno Beach to an also-improved access road near km 14 on the Tourist Corridor. A bus stop is nearby to the northeast. 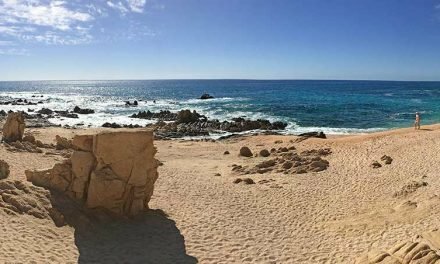 Chileno Beach and Bay. Playa Chileno, 2006. Los Cabos Magazine cover. 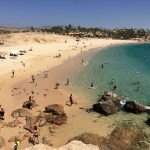 Well known for excellent snorkeling, diving, kayaking and clear aquamarine water teeming with marine life, Chileno (Chilean) is the best all-round beach in the Tourist Corridor. Chileno is wide, fairly flat, perfect for strolling or running, with safe swimming. 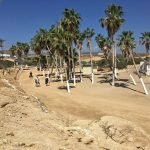 The only beach with restrooms (bring your own tissue), you’ll also find garbage cans, and a palm grove for shade. 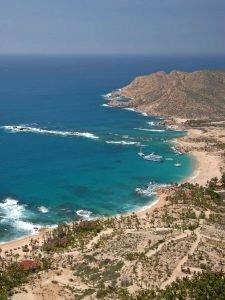 Like Santa María, Chileno receives snorkel tours around midday—head northeast toward the point for more privacy. 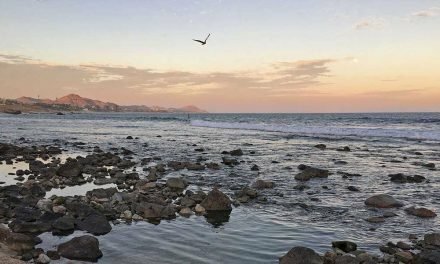 Rocky reefs run parallel to the beach with tropical fish, sea turtles, moray eels, invertebrates, sea urchins, gorgonians (sea fans), sponges, and starfish all abundant. 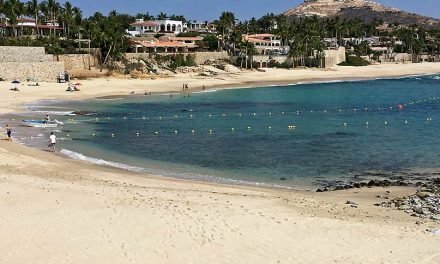 Since the sale of the hotel to the Chileno Bay Club in early 2005, the Cabo Acuadeportes dive shop on the beach has been closed. 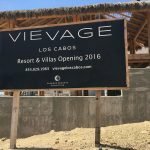 Development plans call for a 36-hole Jack Nicklaus course, villas, homesites, 88-slip marina and yacht club at this private club.